This article refers to the village: for the glen itself, see Glen Coe. The use of the term 'Glencoe Village' is a modern one, to differentiate the settlement from the glen itself. The village occupies an area of the glen known as Carnoch. Native Gaelic speakers who belong to the area always refer to the village as A'Charnaich, meaning "the place of cairns". Even today there is Upper Carnoch and Lower Carnoch. A small hospital - currently empty - with emergency services at Fort William 16 miles away, lies at the southern end of the village just over an arched stone bridge. The village is surrounded by spectacular mountain scenery and is popular with serious hill-walkers, rock and ice climbers. It has been seen in numerous films, including Harry Potter and the Prisoner of Azkaban as the home of Hagrid, and the 2012 James Bond movie Skyfall, also known from Ian Fleming's original novels as the birthplace of James Bond's father Andrew Bond. 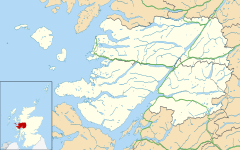 Wikimedia Commons has media related to Glencoe, Highland. ^ "Extract from Scottish Natural Heritage Commissioned Report No.374" (PDF). Retrieved 14 Dec 2014. See paragraph beginning “Glen Coe’s splendour is not diminished as it falls to sea level and meets Loch Leven”. The glen extends to Loch Leven, thereby encompassing Glencoe village. ^ "1911 Encyclopædia Britannica Article "GLENCOE"". Retrieved 14 Dec 2014. "Beginning at the north-eastern base of Buchaille Etive, it [the glen] takes a gentle north-westerly trend for 10 m. to its mouth on Loch Leven, a salt-water arm of Loch Linnhe. ", again encompassing Glencoe village. ^ Tron Bhogha-Froise - Sgeulachdan is Bardachd, Alasdair MacAonghais, Canan, Sabhal Mor Ostaig, An Teanga, Sleite, An t-Eilean Sgitheanach, (1999). This page was last edited on 2 February 2019, at 13:47 (UTC).